Popcorn Time is a little different than what we normally review here on Choose and Watch, as it's actually free software that you run on your machine that attempts to closely mimic Netflix-like services. Once downloaded and installed, Popcorn Time loads up a list of the latest movies and TV shows current out, with the ability to search for previous movies or titles. It doesn't require you to signup or login, in fact the entire system works immediately after installing - and the legality of it remains highly questionable. Once you've started, the program lets you sort by TV Shows and movies and also lets you further filter by sub-genres (action, drama, sci-fi, etc.). Once you've selected a show/movie, you are given details about the movie, including whether subtitles are available and in what languages. You can even watch a trailer of the movie/show before committing to it. An important part of how Popcorn TV works is that it uses torrents, this means that while watching you will be downloading the video and simulatenously uploading it to other users. Based on this, Popcorn asks you to select the quality you wish to see the video in and displays the amount of seeders (people who have the full video) and leechers (the people downloading it) to get a sense of how long it'll take you to buffer/download it. Popcorn Time will then set out to download the video and instead of waiting for the entire file to download, it will download the first chunk of the file and immediately start playing it with subtitles so that you can begin watching it while the rest of the video continues to download it. Initially, it might take a few minutes to load up that first section (depending on your internet speed and quality selected, this should only be a few minutes). Popcorn TIme tries to keep things simple and where it downloads the file is still a mystery, as once it completes playing the movie - it deletes the files to prevent users from keeping it. Once a video is loaded up and starts playing, you will be given the choice to watch it on your current device or to stream it to a number of DNLA services - such as Google Chromecast - effectively letting you watch the video remotely or wherever you want. Did I mention that Popcorn Time also has a mobile app, so you could potentially connect to other DNLA devices to stream the video. You are also provided with the ability to swap in subtitles or change languages, which works pretty well behind the scenes finding the right subtitles for the movie you selected. Moreover, Popcorn Time now even comes with a built-in VPN to protect user's privacy when downloading with torrents. Although, I couldn't get this to work - despite multiple attempts to unlock. A few bugs remain apparent when trying to close out of tv shows or movies, which seldom goes back to the previous screen without making several attempts to click the x to close the video. 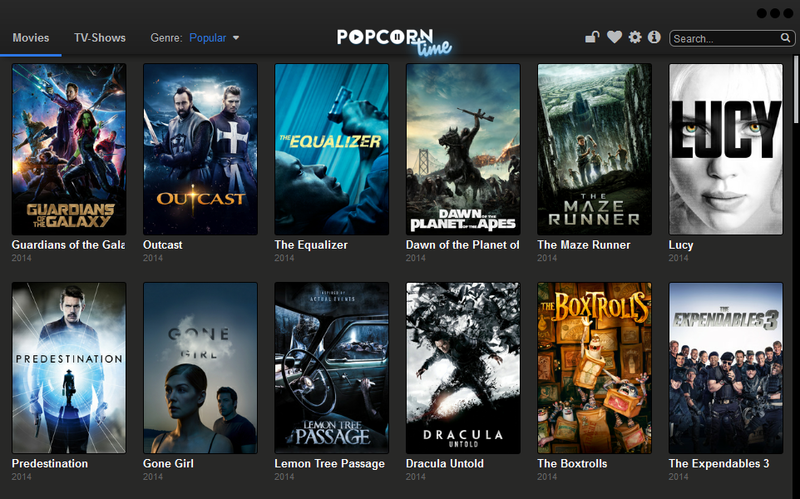 Popcorn Time is a great idea and executed very well - the original creators closed it down, but not before a number of other developers managed to snag the code and replicate it. It's integration with Chromecast makes streaming movies and shows very easy, and makes it a very effective alternative to services like Netflix. 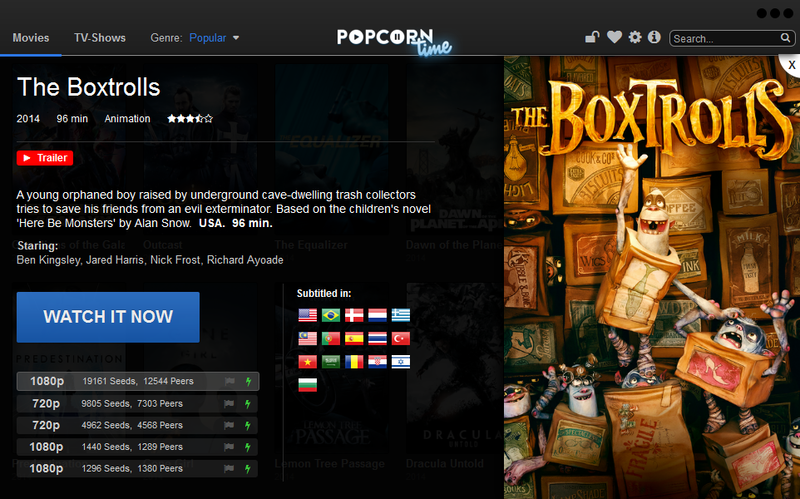 With the closure of the Pirate Bay, Popcorn Time's software as a platform approach might prove difficult for piracy organizations to dent - since it essentially revolves around torrents. The legality is questionable about Popcorn Time, but that asides, it's a very nice system with only a few quirks and bugs in starting and closing videos - all of which could be easily ironed out in future releases. This entry was posted at Sunday, December 28, 2014.You can follow any responses to this entry through the RSS 2.0 feed.You can leave a response , or from your own site.